Keywords: Pregnancy; Pyelocaliceal dilatation; Nephrolithiasis; Cholelithiasis; Portal vein; Right hepatic vein. Descritores: Gravidez; Dilatação pielocalicinal; Litíase renal; Colelitíase; Veia porta; Veia hepática direita. OBJECTIVE: Longitudinal study with B-mode ultrasonography and Doppler ultrasonography of maternal kidneys and liver in low-risk pregnancy, to establish and quantify normality parameters, correlating them with physiological changes. MATERIALS AND METHODS: Twenty-five pregnant women were assessed and selected to participate in the study, each of them undergoing four examinations at the first, second, third trimesters and postpartum. RESULTS: Findings during pregnancy were the following: increased renal volume, pyelocaliceal dilatation with incidence of 45.4% in the right kidney, and 9% in the left kidney; nephrolithiasis, 18.1% in the right kidney, 13.6% in the left kidney. With pyelocaliceal dilatation, mean values for resistivity index were: 0.68 for renal arteries; 0.66 for segmental arteries; 0.64 for interlobar arteries; 0.64 for arcuate arteries. Without pyelocaliceal dilatation, 0.67 for renal arteries; 0.64 for segmental arteries; 0.63 for interlobar arteries; and 0.61 for arcuate arteries. Portal vein flow velocities presented higher values in pregnancy, with mean value for maximum velocity of 28.9 cm/s, and 22.6 cm/s postpartum. The waveform pattern of the right hepatic vein presented changes persisting in the postpartum period in 31.8% of the patients. Cholelithiasis was observed in 18.1% of the patients. CONCLUSION: Alterations in renal volume, pyelocaliceal dilatation, nephrolithiasis, cholelithiasis, changes in portal vein flow velocity, alterations in waveform pattern of the right hepatic vein, proved to be significant. OBJETIVO: Estudo longitudinal, ultrassonográfico com modo B e Doppler, dos rins e fígado maternos na gravidez de baixo risco, para estabelecer, quantificar parâmetros de normalidade e correlacioná-los com as modificações fisiológicas. MATERIAIS E MÉTODOS: Foram examinadas 25 gestantes, realizando-se quatro exames em cada paciente no primeiro, segundo e terceiro trimestres de gravidez e no pós-parto. RESULTADOS: Na gravidez houve aumento do volume renal, dilatação pielocalicinal em 45,4% no rim direito e 9% no rim esquerdo, incidência de litíase renal em 18,1% no rim direito e 13,6% no rim esquerdo. Com dilatação pielocalicinal, o valor médio dos índices de resistividade nas artérias renais foi 0,68; nas segmentares, 0,66; nas interlobares, 0,64; e nas arqueadas, 0,64. Sem dilatação pielocalicinal, o valor nas artérias renais foi 0,67; nas segmentares, 0,64; nas interlobares, 0,63; e nas arqueadas, 0,61. As velocidades de fluxo da veia porta apresentaram valores maiores na gravidez, com valor médio da velocidade máxima de 28,9 cm/s e no pós-parto de 22,6 cm/s. O padrão da onda da veia hepática direita apresentou modificações que persistiram no pós-parto em 31,8%. Colelitíase foi observada em 18,1%. CONCLUSÃO: Mostraram-se significantes as alterações do volume renal, dilatações pielocalicinais, litíase renal, colelitíase, mudanças nas velocidades de fluxo da veia porta e alterações no padrão da onda da veia hepática direita. 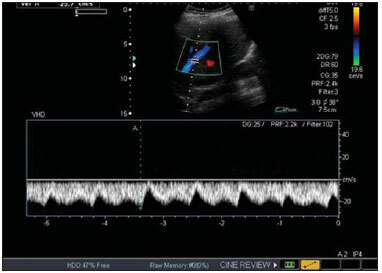 Conventional and pulsed color Doppler ultrasonography are considered to be indicated for the study of gestation and maternal organs on account of the multiplicity of morphological and hemodynamic data that they provide, for being innocuous, for their noninvasiveness and relatively low cost. 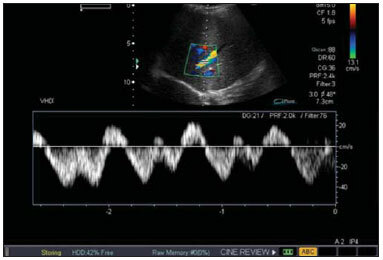 The Doppler modality is utilized for qualitative and quantitative evaluation of the arterial and venous perfusion and can increase the ultrasonography accuracy, identifying the blood flow in the vessels and their respective resistivity (RI) and pulsatility (PI) indices, as well as the study of their indices in the physiological alterations observed during pregnancy. Studies involving Doppler ultrasonography of maternal organs during pregnancy present contradicting results, with little information related to alterations observed during that period. Thus, the authors have developed the present prospective longitudinal study with B-mode ultrasonography and pulsed color Doppler ultrasonography of maternal kidneys and liver in low-risk pregnancy to establish and quantify normality parameters, correlating them with the physiological alterations observed during the gestation. 1) To study, by means of conventional ultrasonography, kidneys, liver and the bile ducts in pregnant patients, establishing the morphological changes of the kidneys and liver in low-risk pregnant women. 2) To establish, by means of pulsed color Doppler ultrasonography, velocity, RI and PI of the renal arteries. 3) To establish, by means of pulsed color Doppler ultrasonography, RI and PI of intra-renal arteries (segmental, interlobar and arcuate) and the initial systolic acceleration of the segmental arteries. 4) To establish the presence of renal lithiasis. 5) To establish, by means of pulsed color Doppler ultrasonography, portal vein flow velocities. 6) To establish, by means of pulsed color Doppler ultrasonography, the flow and wave pattern of the right hepatic vein. 7) To establish the presence of cholelithiasis. 8) To correlate the observed results with the physiological changes in pregnancy. In studies performed during pregnancy, pyelocaliceal dilatation is most frequently observed in the right kidney(1-5) . As regards studies of RI and PI of the renal arteries, no significant differences are found in such indices during pregnancy(6,7). In a study, RI decrease is observed in the renal arteries(8) while, in another, RI increase is observed in the renal arteries(9). The RIs of the interlobar and arcuate arteries do not present any significant difference in the presence of pyelocaliceal dilatation(10,11) . As pregnancy develops, changes are observed in the wave pattern of the right hepatic vein(12), which in some patients persists during puerperium(13). The mean value of portal vein velocity is significantly higher during pregnancy(12), persisting during puerperium(13). The authors standardized the investigation protocol as well as of the performance of the scans and data acquisition. The present study evaluated a group of 25 low-risk pregnant women coming from the SUS (the Brazilian Unified Health System), without any previous underlying disease and with prenatal follow-up results within normality parameters. The patients underwent ultrasonography scans at Instituto de Radiologia of Hospital das Clínicas da Faculdade de Medicina da Universidade de São Paulo (InRad/HC-FMUSP) in São Paulo, Brazil. The patients were informed on the study project and agreed in participating by signing a term of free and informed consent. The scans were performed by a single operator (performing investigator) in a Toshiba Aplio XG ultrasonography apparatus. The picture archiving and communication system (Philips Healthcare iSite Enterprise) was utilized for sonographic data filing and distribution. Data regarding the 25 pregnant patients were collected. Each patient underwent four scans, respectively at the first trimester of pregnancy up to 13 weeks and 6 days; at the second trimester between 14 weeks and 27 weeks and 6 days; at the third trimester between 28 weeks and delivery; and in the postpartum period, between 8 and 22 weeks after delivery. The first patient had her scan in August/2008 and the last scan in August/2010. For all patients, personal data such as age, number of pregnancies, deliveries, abortions and previous diseases were evaluated. Weight and height were recorded, and body mass index and body surface area were calculated. Also, systolic and diastolic arterial pressures as well as heart rate were evaluated. All such data were followed-up during pregnancy and in the postpartum period. All patients underwent obstetric examination and gestational ages were calculated. Ultrasonography was performed with the patients in horizontal dorsal decubitus and in right and left lateral decubitus for the renal scan, and in left lateral decubitus for the liver scan. The evaluations were performed in the lumbar region, adjacent to the anterior, middle and posterior axillary lines, intercostal and subcostal lines, with the purpose of appropriately evaluate the structures to obtain the best renal and hepatic characterization. The parameters acquisition was carried out under intermediate apnea during normal breathing rhythm, i.e., without deep inspiration and expiration. 1) Hepatic and renal morphological alterations. 2) Renal measurements including longitudinal, transverse and anteroposterior diameters and renal volume. 3) Presence of pyelocaliceal dilatation and measurement of the pelvic diameter and maximum calyceal diameter. The classification of the pyelocaliceal dilatation was based on the maximum calyceal diameter as proposed by Peake et al. (2), as follows: grade 0, normal - calyceal diameter between 0 and 5 mm; grade I, mild dilatation - calyceal diameter between 6 and 11 mm; grade II, moderate dilatation - calyceal diameter between 11 and 15 mm; grade III, severe dilatation - calyceal diameter > 16 mm. 4) Measurements of the systolic and diastolic velocities, RI and PI in the right and left renal arteries. 5) RI and PI of the right and left intrarenal arteries (segmental, interlobar and arcuate) and initial systolic acceleration of the segmental arteries were measured. It was established to perform the measurements in the middle segmental, upper interlobar and lower arcuate arteries. In the presence of pyelocaliceal dilatation, measurements were taken on the interlobar arteries in the three segments, i.e., in the upper, middle and lower interlobar arteries. 6) The presence of renal lithiasis was evaluated during all the scans in order to observe its onset with the development of gestation. Hyperechogenic images with defined posterior acoustic shadowing, with dimensions > 5 mm, located is the renal calyces, were characterized as renal lithiasis. 7) In the portal vein, the maximum, median and minimum velocities were measured. 8) In the right hepatic vein, flow and wave pattern were evaluated. According to Roobottom et al. (12), the wave pattern is classified as normal, damped and flat. The normal pattern is characterized in the presence of a reverse flow period during the cardiac cycle; the damped pattern is observed in the absence of reverse flow and in the presence of wave variation, where the minimum velocity divided by the peak velocity was > 50%; and the flat pattern is defined as the minimum velocity divided by the peak velocity was < 50%. 9) The presence of cholelithiasis was evaluated in all the scans in order to observe its onset with the development of gestation. Hyperechogenic images with defined posterior acoustic shadowing and dimensions > 5 mm located in the gallbladder was characterized as cholelithiasis. Three out of the 25 patients could not complete the postpartum assessments for the following reasons: one of them had a preterm delivery and missed the third semester scan; the second patient moved from the city soon after delivery; and the third patient refused to attend the appointment, even after insistent requests from the performing investigator. It should be mentioned that in the postpartum period, there was a greater difficulty in having the patients attending their scan appointments, and those scans that should have been performed at eight weeks after delivery were actually completed between 8 and 27 weeks after delivery. Tables were prepared with all data obtained from de scans, and such data were submitted to statistical analysis by a specialized professional of the InRad/HC-FMUSP. The data in the present study were analyzed on the basis of a significance level of 5% (α = 0.05), according to the common general standard for the medical and biological areas. Thus, the calculated values for error probability (p) when < 0.05 were considered to be statistically significant, and when > 0.05, were considered as not statistically significant. The following parameters were calculated: arithmetic mean, median, minimum and maximum value of the data, standard deviation, percentiles (0%, 25%, 50%, 75%, 100%), confidence intervals for 95% and coefficient of variation). Ratios were calculated by means of percentages. The variations between three or more dependent variables were analyzed by means of the non-parametric Friedman's statistical test. On their turn, as post-hoc tests, the variations between pairs of dependent variables were analyzed by means of the Wilcoxon nonparametric test. Among the most utilized statistical softwares, the following were utilized for the calculations: Microsoft Excel 2007; SPSS for Windows (SPSS Inc.) release 10.0.1, 1999; Statistics for Windows, version 8.0, 2007 (StatSoft Inc.; Tulsa, OK, USA). The renal volume presented changes as the pregnancies developed, with a progressive renal volume increase up to the third gestational trimester and volume decrease in the postpartum period. Such changes were statistically significant (Figure 1). Figure 1. Right and left renal volume. No dilatation was observed at the first gestational trimester. At the second trimester scan, ten patients presented with pyelocaliceal dilatation in the right kidney (three cases grade I; six, grade II; and one, grade III). At the third gestational trimester, three out of nine patients with dilatation presented grade I, two grade II, and four grade III. In the postpartum period, nine out of the patients who presented dilatation, had regression of the condition. In only one patient the dilatation persisted in the puerperium, with grade II pyelocaliceal dilatation, but that patient also presented with renal lithiasis, which caused the persistent dilation in the postpartum period (Figure 2). Figure 2. Incidence of pyelocaliceal dilatation in the right and left kidneys. Only two patients presented with pyelocaliceal dilatation in the left kidney, with one case being grade I, and the other grade II in the second gestational trimester, and in the third trimester, one with grade II dilatation and another with grade III dilatation. In the postpartum period, both cases regressed (Figures 2 and 3). Figure 3. Left kidney (RIM ESQ. )presenting grade II pyeolocaliceal dilatation and lithiasis. The incidence of pyelocaliceal dilatation in the right kidney reached 45.4%, therefore being statistically significant, while in the left kidney the incidence was 9% (Figure 2). In the first, second and third gestational trimesters, the systolic and diastolic velocities of the renal arteries presented with higher values as compared with those observed in the postpartum scans. In the group of patients with pyelocaliceal dilatation, the mean bilateral RI in the renal arteries was 0.68; in the middle segmental arteries the value was 0.66; in the upper interlobar arteries, 0.64; and in the lower arcuate arteries, 0.64 (Table 1). The mean value for the upper, median and lower interlobar arteries was 0.63. The postpartum value of RI in the renal arteries was 0.67, while in the middle segmental arteries the value was 0.64, in the upper interlobar arteries was 0.63 and in the lower arcuate arteries, 0.61 (Table 1). In the group of patients that did not present with pyelocaliceal dilatation, the mean bilateral RI in the renal arteries was 0.66; in the medial segmental arteries, 0.64; in the upper interlobar arteries, 0.62; and in the lower arcuate arteries, 0.61. The postpartum RI in the renal arteries was 0.65; in the medial segmental arteries, 0.59; in the upper interlobar arteries, 0.59; and in the lower arcuate arteries, 0.59 (Table 1). 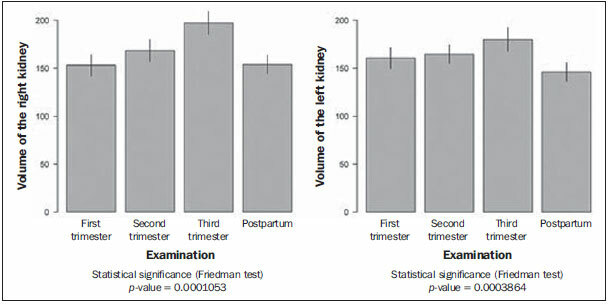 The renal indices were higher during the pregnancy as compared with those in the postpartum period. In the group of patients presenting with pyelocaliceal dilatation, the renal indices where higher than those in the group without pyelocaliceal dilatation. However, such differences were not statistically significant. The initial systolic acceleration was > 3.0 in the scans performed both during pregnancy and in the postpartum period. In the first gestational trimester, no cases of renal lithiasis were observed. One patient presented with a cyst with calcification in the right kidney, which persisted in all the scans. In the second trimester, three patients presented with bilateral calyceal lithiasis, and one patient presented with calyceal lithiasis in the right kidney only. In all cases, the lithiasis persisted in the third trimester and in the postpartum period (Figure 3). The incidence of lithiasis was 18.1% in the right kidney and 13.6% in the left kidney, a statistically significant incidence. Maximum, mean and minimum velocities were measured. During pregnancy, the portal vein velocities presented higher values than in the postpartum period. The mean value for maximum velocity in the portal vein was 30.57cm/s in the first trimester, 28.57 cm/s in the second, and 27.63 cm/s in the third trimester, with a mean value of 28.9 cm/s during pregnancy and 22.6 cm/s in the postpartum period. 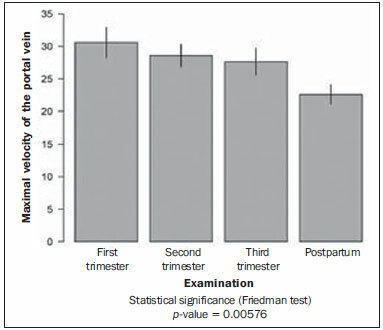 The difference between the values during pregnancy and those in the postpartum period was statistically significant (Figure 4). Figure 4. Maximal velocity in the portal vein. In the first trimester, the wave pattern was normal (Figure 5), with the only exception for one patient who presented with the damped pattern (Figure 6). In the second trimester, 13 patients presented with normal pattern, and 9 patients presented with the damped pattern, with a predominance of the normal pattern. In the third trimester, 5 patients presented with the normal pattern, 13 patients with the damped pattern, and 4 patients with the flat pattern (Figure 7), with a predominance of the damped pattern (Figure 6). Figure 5. Right hepatic vein with normal wave pattern. Figure 6. Right hepatic vein with damped wave pattern. Figure 7. Right hepatic vein with flat wave pattern. In the postpartum period, 15 patients presented with the normal pattern (Figure 5), while in 7 patients the damped pattern persisted (Figure 6), demonstrating that even several weeks after delivery, the changes in wave pattern of the right hepatic vein persisted in 31.8% of the patients, which was statistically significant. In the first gestational trimester, no cases of lithiasis were observed in the gallbladder. In the second trimester, two patients presented with lithiasis, and in the third trimester, two other patients presented with lithiasis, thus totaling four cases. There was an increase in the number of cases of lithiasis as the pregnancy developed, with a statistically significant incidence of 18.1%. Ultrasonography, particularly with the utilization of Doppler, has been increasingly studied and utilized in several clinical conditions, especially in pregnant patients. In some situations as in gestational trophoblastic disease(14) in the prediction of pre-eclampsia(15), such method of evaluation has demonstrated its positive impact on pre-natal follow-up. Several other studies have been undertaken, demonstrating that obstetric ultrasonography presents good sensitivity in the screening fetal malformations of the central nervous system, in special with the continuous improvement and mastery of the utilization of specialized methods such as Doppler and volumetric (3D/4D) ultrasonography, contributing to make it the method of choice in such a routine(16). As the cerebral blood flow was evaluated, it was also demonstrated that breastfeeding influences the velocities. The RI decreased in the anterior cerebral artery and middle cerebral artery as the mean velocity increased significantly during suction while breastfeeding(17). Another feature studied under Doppler mapping were the repercussions of the uterine scar on Doppler velocimetry of uterine arteries. Such a study, performed between 26th and 32th gestational weeks, concluded that there are no repercussions from previous Cesarean section scar on Doppler velocimetry of the uterine arteries(18). It is a known fact that hemodynamic changes and, consequently, Doppler flowmetry changes occur in the liver and kidneys during gestation. However, there is a gap in the Brazilian literature as regards the demonstration and explanation of such alterations. Thus, the authors have developed the present study to investigate and describe the alterations observed in the liver and kidneys during the pregnancy. So, the relevance of the present study lies principally on the quantification of possible changes observed in those organs and on the suggestion of normality values during pregnancy and in the postpartum period. The alterations found in the present study were correlated with the physiological alterations of pregnancy. The explanation of the cardiac changes is important, as they are related to the hemodynamic changes of the hepatic vessels. Around the 10th gestational week, the cardiac output starts to increase, reaching a plateau of up to 40% above the baseline, at the 20th gestational week, and that is caused by the increase in plasma volume and heart rate. The size of the heart increases by approximately 10% due to the increased intra-abdominal pressure. The cardiac capacity increases by approximately 80 mL because of the increase in volume and also because of the cardiac muscle hypertrophy and hyperplasia(19). During pregnancy, the kidneys increase in volume, weight and approximately 1 cm in size due to the expansion of the vascular and interstitial space. One observes increased plasma flow, decreased peripheral vascular resistance of the kidneys and increase in glomerular filtration(20) of about 50% in the first weeks of pregnancy, so remaining until the end of pregnancy, returning to pre-gestational levels around the 20th postpartum week. The most important renal morphological changes involve the calyces, the renal pelvis and the ureters. The incidence of pyelocaliceal dilatation was higher in the right kidney, reaching 45.4%, a statistically significant percentage, while in the left kidney the incidence was 9%. With respect to the causes of pyelocaliceal dilatation, two theories are considered. The first cause is mechanical, due to compression of the ureter by gravid uterus at the level of the intersection with the iliac vessels. The higher frequency in the right kidney is explained by the anatomical position of the right ureter, which, at the level of its intersection with the iliac vessels, presents a sharp loop, while the left ureter presents a pathway almost parallel to the ovarian vein. The second cause is hormonal due to increased progesterone levels causing relaxation of the ureteral musculature, with a decrease in ureteral peristalsis and consequential ureteral dilation(2,3,21). Such physio-anatomical changes lead to urinary stasis with pyelocaliceal dilatation(15,22), more common at right, in the end of the second gestational trimester and beginning of the third trimester, and may be similar to pathological conditions such as hydronephrosis. In studies undertaken during pregnancy, the incidence of pyelocaliceal dilatation reached 86% predominance in the right kidney in relation to the left kidney(1), incidence of 90% in the right kidney and 67% in the left kidney(2), incidence of 89.3% in the right kidney and 71.4% in the left kidney(3), incidence of 63.7% in the right kidney and 20% in the left kidney(4), and incidence of 50% in the right kidney and 20% in the left kidney(5). The renal indices during pregnancy were higher than those in the postpartum period. The renal indices in the group presenting with pyelocaliceal dilatation presented were higher as compared with the group without pyelocaliceal dilatation. However, the differences in values were not statistically significant. In other studies during pregnancy, the RI in right renal arteries was 0.68, in left renal arteries was 0.69, and in nonpregnant patients was 0.58, with significantly increased RI during pregnancy(9); in the renal arteries the mean RI was 0.65 both in pregnant and nonpregnant patients, the PI was 1.18 in pregnant and 1.25 in nonpregnant patients, without significant changes(7). No significant differences were observed in RI and PI of renal, interlobar and interlobular arteries in pregnancy(6). Decreased RI was observed in the renal and uterine arteries between the 35th and 38th gestational weeks(8). In the interlobar and arcuate arteries the mean RI was 0.61(10) and in the interlobar and arcuate arteries the RI was 0.59 and PI was 1.04(11), with no significant difference, in both studies, during pregnancy and also in relation to pyelocaliceal dilatation. Pregnancy is a complex condition of physiological and mechanical alterations, affecting the risk factors for development of renal lithiasis. Nephrolithiasis is a more complex situation in pregnancy due to imaging methods limitations and treatment restrictions. Ultrasonography remains as the first-line diagnostic method(23). However, ultrasonography is nonspecific to differentiate between ureteral obstruction secondary to lithiasis from physiological pyelocaliceal dilatation. Magnetic resonance imaging can differentiate between physiological and pathological dilatation(24). The incidence of nephrolithiasis in the right kidney was 18.1% and in the left kidney, 13.6% considered to be statistically significant. All patients with nephrolithiasis also presented with pyelocaliceal dilatation. As the pregnancy progressed, the development of gallbladder lithiasis was observed in some patients, with an incidence of 18.1%, which was considered to be statistically significant. The function of the gallbladder is modified during pregnancy due to hypotonia of the smooth muscle wall. The biliary emptying is slow and incomplete, always maintaining a considerable residual volume. Stasis, the constitution of the bile that becomes thicker, and the increased cholesterol saturation predispose to development of pregnancy-related lithiasis(19). In another study, the incidence of cholelithiasis was 12%(25). In the portal vein, higher values of flow velocity were observed during pregnancy, with decrease in the postpartum period. During pregnancy, the mean value of the maximum velocity in the portal vein was 28.9 cm/s and in the postpartum it was 22.6 cm/s, a statistically significant difference. Relevant factors include increased cardiac output and decreased systemic vascular resistance. In the present study, the maximum velocity in the portal vein (28.9 cm/s) was significantly higher than the value reported in a previous study with nonpregnant patients (mean of 16.5 cm/s)(26). In another study, the mean velocity in the portal vein was 28 cm/s during pregnancy(12) , significantly higher than in the healthy nonpregnant population (mean of 16.5 cm/s)(26). In the period between 6th and 8th postpartum weeks, the portal vein velocity was 27.7 cm/s(13). In the right portal vein, a statistically significant wave pattern variation was observed. In the present study, in the first trimester, 95.5% of the patients presented with normal pattern and 4.5% presented with damped pattern, with prevalence of the normal pattern. In the third trimester, 59.1% of the patients presented with the damped pattern, 22.7% with the normal pattern, and 18.2% with the flat pattern, with prevalence of the damped pattern. Several weeks after delivery, 31.8% of the patients remained with the damped pattern. The hepatic veins are in direct communication with the right atrium, and alteration in the pressure in the right atrium affects the hepatic veins pulsatility. It was suggested that the increased cardiac output in pregnancy, together with the increase in the velocity in the portal vein and the pressure exerted by the increased volume of the gravid uterus on the iliac veins and in the inferior vena cava, contribute to a change in hepatic veins wave pattern(12). Marked changes in wave pattern in the last 10 gestational weeks were reported by other studies as follows: 80% flat, 12% damped and 8% normal(12); in the period between the 6th and 8th puerperal weeks, the middle hepatic vein pulsatility was normal in only 60%, damped in 23%, and flat in 17%(13). The partial normalization of hepatic vein pulsatility may result in persistence of the cardiac output due to the relief in the compression of the inferior vena cava, in association with increased drainage of choriodecidual blood to the circulation and also the rapid interstitial fluid mobilization(27). Doppler flow velocimetry of the right hepatic vein in patients presenting with non-alcoholic steatosis demonstrated three-phase flow in 95% of the normal controls and in 56.3% of the patients with mild steatosis, while in those patients with severe steatosis, the pattern was monophasic in 60%, possibly suggesting decreased vascular complacency consequential to fat infiltration(28). In the present study, the authors utilized the classification proposed by Roobottom et al. (12) where the normal pattern in the above mentioned study corresponds to "three-phase", and the flat pattern corresponds to "monophasic". The authors correlated the observed alterations with the physiological changes of pregnancy. In the gestational period, increase in renal volume, pyelocaliceal dilatation (more frequent in the right kidney) and presence of renal lithiasis were significant. The renal indices presented higher values in pregnancy and also in the presence of pyelocaliceal dilatation, however such differences were not statistically significant. Some of the patients did not present cholelithiasis at the first scan, but developed it during the gestational period, with cholelithiasis being significant in pregnancy. Portal vein flow velocities presented higher values in pregnancy, and the difference of mean value for portal vein maximum velocity in relation to the postpartum period was statistically significant. In the right hepatic vein, there was a predominance of the normal pattern in the first and second gestational trimesters. In the third gestational trimester, the damped pattern predominated. In the postpartum period, the incidence of the damped pattern was significant, persisting for several weeks after delivery. It was possible to observe that even after several weeks after delivery, not all pregnancy physiological changes evolved back to the normality pattern, for example, the persistent changes in the right hepatic vein. 1. Fried AM. Hydronephrosis of pregnancy: ultrasonographic study and classification of asymptomatic women. Am J Obstet Gynecol. 1979;135:1066-70. 2. Peake SL, Roxburgh HB, Langlois SL. 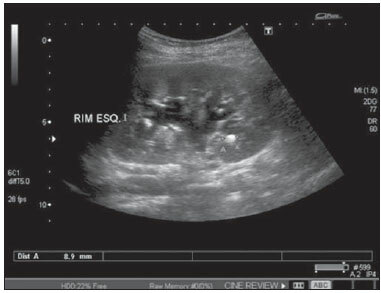 Ultrasonic assessment of hydronephrosis of pregnancy. Radiology. 1983;146:167-70. 3. Woo JS, Wan CW, Ma HK. Pregnancy hydronephrosis - a longitudinal ultrasonic evaluation. Aust N Z J Obstet Gynaecol. 1984;24:9-13. 4. Cietak KA, Newton JR. Serial qualitative maternal nephrosonography in pregnancy. Br J Radiol. 1985;58:399-404. 5. Faúndes A, Brícola-Filho M, Pinto e Silva JL. Dilatation of the urinary tract during pregnancy: proposal of a curve of maximal caliceal diameter by gestational age. Am J Obstet Gynecol. 1998;178:1082-6. 6. Sturgiss SN, Martin K, Whittingham A, et al. Assessment of the renal circulation during pregnancy with color Doppler ultrasonography. Am J Obstet Gynecol. 1992;167:1250-4. 7. Dib FR, Duarte G, Sala MM, et al. Prospective evaluation of renal artery resistance and pulsatility indices in normal pregnant women. Ultrasound Obstet Gynecol. 2003;22:515-9. 8. Sohn C, Fendel H. The renal artery and uterine circulation in normal and toxemic pregnancies. Z Geburtshilfe Perinatol. 1988;192:43-8. 9. Kurjak A, Vidovic MI, Velemir D, et al. Renal arterial resistance index in pregnant and nonpregnant women: evaluation with color and pulse Doppler ultrasound. J Perinat Med. 1992;20:11-4. 10. Hertzberg BS, Carroll BA, Bowie JD, et al. Doppler US assessment of maternal kidneys: analysis of intrarenal resistivity indexes in normal pregnancy and physiologic pelvicaliectasis. Radiology. 1993;186:689-92. 11. Kara SA, Toppare MF, Saraç E. Pyelocaliectasis and intrarenal artery Doppler indices in uncomplicated pregnancies. Gynecol Obstet Invest. 1999;48:18-21. 12. Roobottom CA, Hunter JD, Weston MJ, et al. Hepatic venous Doppler waveforms: changes in pregnancy. J Clin Ultrasound. 1995;23:477-82. 13. Pekindil G, Varol FG, Yüce MA, et al. 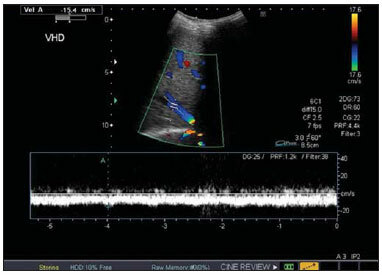 Evaluation of hepatic venous pulsatility and portal venous velocity with Doppler ultrasonography during the puerperium. Eur J Radiol. 1999;29:266-9. 14. Farias MS, Santi CC, Lima AA, et al. Radiological findings of uterine arteriovenous malformation: a case report of an unusual and life-threatening cause of abnormal vaginal bleeding. Radiol Bras. 2014;47:122-4. 15. Calixto AC, Brandão AHF, Toledo LL, et al. Prediction of preeclampsia by means of Doppler flowmetry of uterine artery and flow-mediated dilation of brachial artery. Radiol Bras. 2014;47:14-7. 16. Barros ML, Fernandes DA, Melo EV, et al. Central nervous system malformations and associated defects diagnosed by obstetric ultrasonography. Radiol Bras. 2012;45:309-14. 17. Monteiro AMV, Lima CMAO, Medina P. Is there any influence of breastfeeding on the cerebral blood flow? A review of 256 healthy newborns. Radiol Bras. 2012;45:263-6. 18. Santos Filho OO, Nardozza LMM, Araujo Júnior E, et al. Repercussions of previous cesarean uterine scar at uterine arteries Doppler velocimetry between the 26th and 32nd gestational weeks. Radiol Bras. 2011;44:163-6. 19. Federação Brasileira das Sociedades de Ginecologia e Obstetrícia. Assistência pré-natal. Manual de orientação. Febrasgo; 2007. 20. Loughlin KR. Management of urologic problems during pregnancy. Urology. 1994;44:159-69. 21. McAleer SJ, Loughlin KR. Nephrolithiasis and pregnancy. Curr Opin Urol. 2004;14:123-7. 22. Wayment RO, Schwartz BF. Pregnancy and urolithiasis. [cited 2009 Mar 19]. Available from: http://emedicine.medscape.com/article/455830-overview. 23. Semins MJ, Matlaga BR. Kidney stones during pregnancy. Nature Reviews Urology. 2014;11:163-8. 24. Masselli G, Derme M, Laghi F, et al. Imaging of stone disease in pregnancy. Abdom Imaging. 2013;38:1409-14. 25. Almashhrawi AA, Ahmed KT, Rahman RN, et al. Liver diseases in pregnancy: diseases not unique to pregnancy. World Gastroenterol. 2013;19:7630-8. 26. Ohnishi K, Saito M, Nakayama T, et al. Portal venous hemodynamics in chronic liver disease: effects of posture change and exercise. Radiology. 1985;155:757-61. 27. Resnik R. The puerperium. In: Creasy RK, Resnik R, editors. Maternal-fetal medicine: principles and practice. 3rd ed. Philadelphia, PA: Saunders; 1994. p. 142-3. 28. Borges VFA, Diniz ALD, Cotrim HP, et al. Hepatic vein Doppler flowmetry in patients with nonalcoholic steatosis. Radiol Bras. 2011;44:1-6. Accepted after revision October 14, 2014. Study developed at Department of Radiology, Hospital das Clínicas da Faculdade de Medicina da Universidade de São Paulo (HC-FMUSP), São Paulo, SP, Brazil.